The lore of the elevator pitch comes from the early days of Hollywood when one would hope to trap an executive in an elevator and ‘pitch.’ The Elevator Pitch is an enduring shorthand that represents the simplest description of what you do. The Elevator Pitch is dead. What we aim for is Elevator Engagement. We achieve our goal more effectively and efficiently if we focus on the two-way (engagement) and not the one-way (pitch). Instead of spewing for 20-60 seconds (even if succinct), think about one great question you can ask the other person to get them ENGAGED in a conversation. In asking a question, you start with the other person’s construct (or gestalt!). If you start with a question, you immediately learn what is pertinent and non-pertinent. You can use a short amount of time on relevant information. Finally, we can position our work in their words. LISTENING is one of the most powerful selling skills in the world. Earlier this year we were helping an organization make a neuroscience pitch to a foundation. The executive director was asked to appear before the foundation board and ‘make a pitch’. We had to reprogram her default, one-way pitch, to instead starting with a question to the panel of eight. She simply asked, “Has anyone ever had experience with a stroke, or a family member that’s had a stroke?” The board chair raised his hand and then spent two minutes talking about the importance of neuroscience research. Others jumped in. They were engaged — fully. The executive director was able to simply build on the conversation. Though she had eight slides prepared, she found she only needed to use three of them (in response to the conversation). The board said it was one of the best pitches they had ever received – that’s because she didn’t pitch; she engaged. She was awarded the grant! Nota bene: There are many circles (usually tied to funding communities, e.g., silicon valley and nyc / financial) where a ‘pitch-deck’ is standard affair. Don’t let the ‘pitch deck’ put you in ‘pitch mode.’ As in the neuroscience story, you should focus on engagement. And, of course, we’re partial to the one-page pitch deck! What Does ‘An Ask’ Look Like? A Checklist. There is a lot of room to define this one… you should take the time to define it within your organization. We were WITH a prospect – physically. See: Just Visit. There are exceptions to this but 19 times out of 20 the ask is done in person so that there is engagement and dialogue. We asked the prospect for specific help with a specific project, program or level of support. Also, in being specific, the funding rationale wasn’t for ‘unrestricted’ or ‘operations’… those aren’t specific. See: Have a Funding Rationale – Something specific to ask for. The ask was a dialogue – a back and forth with questions and listening — so that we could ensure that we were maximizing the relationship at this given moment. Read: The Ask as a Dialogue to help with this concept. We will expect a YES or a NO – and will follow-up accordingly. Thinking about how to get to a YES or NO ensures you have covered appropriate mechanics and you can continue within a sales process. Otherwise, there is a risk of pending into oblivion or unclear follow-up. Here is a framing device to help you answer any question in a calm and confident manner. It’s called The Rule of 3. The Rule of 3 is simply the framing of THREE things to simplify a concept. The organization has a complete business plan that details every penny for each city. However, it would’ve been too vague to say, “Yes, we a complete business plan… it’s here in 40 pages.” So the ED froze. Simply by summarizing the 40 pages in three bullet points the ED delivered confidence and clarity in her response. The Rule of 3 is a magic framing device. Studies have shown that we as humans are wired to receive and remember three’s. Four bullet points seems like ‘too much’ and two seems like ‘not enough’. Also, observe the Rule of 3 in action with any great speaker, marketer or politician. Now that you’re looking for it… it will appear EVERYWHERE! Tom first shared the Rule of 3 with me about ten years ago. It’s since proven time and time again to be the most powerful framing device there is because 1) It’s simple 2) Easy to use and 3) Humans are hard wired to positively receive groups-of -threes. We use an Altitude Framework to order thinking, communications and storylines. In sharing this with others one goal is simply to make everyone aware of 30,000′ and what it means to “share the message and story at 30,000′”. People respond to you at whatever level you communicate. So, if you’re at 3′, talking about where the architects are placing bathrooms, this will frame the conversation. Instead, if you’re at 30,000′, talking about changing and saving lives… the conversations will be different. One example: Last year I worked with a well-respected social entrepreneur and Ashoka fellow. A driven individual and true visionary, he gets up every morning trying to change the face of poverty. Whenever he went to make an ask, however, the conversation always turned into a debate about the business model (at 14,000′). The Altitude Framework helped him to see why this was happening. Being an award-winning social entrepreneur, his message had taken shape around ‘doing business in a different way’… about ‘earned income’… about ‘not relying on philanthropy’… about being ‘best in the world at being sustainable’. Naturally, prospects were engaging him at this level (14,000′). The 30,000′ WHY wasn’t coming through in his message. His story needed to be about being best in the world at changing the face of poverty (30,000′) — first — and then incorporating a different business model (at 14,000′). The Altitude Framework was a simple tool that made him aware of his 30,000′ message. I’m happy to report his funding conversations changed considerably based on this conscious framing exercise. For Impact Message: Impact Drives Income. As it applies to the ask… one example. Use a project to drive the ask. That is, if you have a project that is going to require $80K to fund, ask for the project… the IMPACT (rationalizing $80K) instead of just trying to guess a number that you think ‘will be a stretch but not too much of a stretch’. You will never know EXACTLY what to ask for so instead of guessing, communicate the need. If it’s too much, the prospect will let you know. If too little.. that’s okay, you have a lifetime relationship and you can certainly talk to the prospect about other projects. There can only be ONE leader on a visit. Just off the phone with a team that’s prepping for a big visit this afternoon. We were doing a last minute strategic run-through. On this visit it’s going to be the ED, a Director of Development and the prospect. They’re going to be doing a tour followed by a sit-down discussion about an $8M effort. As part of the process we always establish ONE leader. This is the person that is responsible for managing the FLOW of the visit. One thing’s for certain. No visit ever goes as planned. If you’re on the team it’s imperative to know the ONE person that’s responsible for getting to the goal. Can’t be two leaders. Worse than two leaders is establishing no lead. If I’m leading I will advise the other person, “If if things seem totally de-railed I will have a plan in my head I’m following. It’s important I communicate that so you don’t panic if we seem way off track.” Having done this now hundreds and hundreds of times I will let the prospect lead a lot… because I want to listen. One leader. Not two. Not three. Definitely not zero. I’m assembling a number of closes we cover at our Boot Camp and in our training/strategic coaching. Hopefully, I’ll end up with a solid guidebook we can share with readers. Over the next few weeks I’ll publish a few closes to the blog. Most closes come from a 70 minute audio on closing I recorded last year. The Steve Jobs Close is about closing at the highest level. Understanding this ‘close’ begins with a (likely embellished) story about Steve Jobs. In 1984, Apple was looking to hire new CEO. The company was growing beyond the reaches of the young Steve Jobs. The board wanted some seasoned leadership for the journey ahead and they set their sites on PepsiCo VP John Scully. As the legend goes, the board spent two days talking with Scully about compensation, market segments, business plans, products, etc. At the end of two full days, Scully said, “thanks but no thanks” and turned down the offer. Scully go it. He took job. He was CLOSED. Unfortunately, Scully went to Apple and tanked it. That’s a different story that ends happily enough with Jobs retaking the helm and inventing the iWorld. I love this story. I use it often. The Steve Jobs Close is really a story about closing at the highest level. The board was mulling around with strategy and tactics. People don’t BUY strategy (think: 14,000 ft). They BUY vision! They BUY purpose! As Zig Ziglar says, “People buy on emotion and justify on logic.” Don’t lose site of this. You need both emotion and logic but sometimes we need to jump back up to the emotional hook or you can get lost in the logic. A story from the field. I was working with Junior Achievement — an incredible organization –- to fund a vision that included the expansion and renovation of a building. I teamed up with our board chair to visit with our very best prospect… the person we hoped would make the lead investment on the project. This transitioned to a dialogue about leadership at $1Million. Mrs. Investor laughed a little (because I wasn’t as graceful as Steve Jobs). However, she felt the gravity and sincerity in what we were asking. After thinking for about 30 seconds she then asked us a series of very introspective questions and ultimately agreed to lead the vision… and lead it with a $1Million commitment. Note: As I write up real stories from the field I always alter little things – like a name, an organization or a city because I’m talking about real people and real funders. Though I’ve changed some names and places, the story really happened – exactly in this way. I did a pretty decent Presentation to a very, very experienced development group on Saturday in Tampa, Florida. The NACCDO is an organization of marketing and development officers of the top CANCER CENTERS in the United States. This conference was hosted by Moffitt Cancer Center, a truly World Class Organization. My topic was ACCELERATING THE ASK. After the introduction (and tripping and falling), I had about 60 minutes. I prepared for three weeks, plus the entire plane ride to Tampa, plus until midnight the night before and at 5:00 a.m. the next morning. It’s kind of hard to take 50+ years of selling (I remember first ‘sale’ at 10 years old), 37 years of development work, our two-day boot camp/training camp/sales training into 60 minutes. But, I tried anyway. One of the pretty cool things that came out of this session, at least for me, was getting all of our FRAMEWORKS and DEVICES on the front/back of an 8½ x 11 sheet of paper. Here is the pdf. You can even blow it up as a POSTER (which I did for the group on Saturday). It is, literally, pretty much everything I know about THE ASK. I hope it helps. 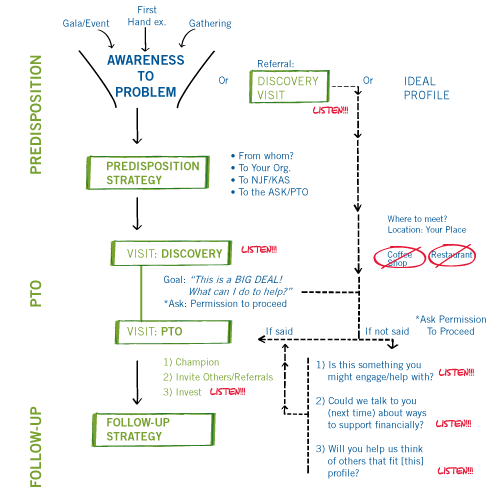 Wanted to share this illustration of a customized sales process Kerry and I did with a client. If you’ve been to a workshop you will recognize Predisposition > PTO (Present the Opportunity) > Follow-up from the Roadmap: Sales Process. Though we made it for one client, I think it’s pretty near universal. VISIT! Do Discovery and then PTO… could be two visits or one but not more. The GOAL is a big deal to me… if we can get them to say, “Wow, this is great, what can I do to help?” Then it’s not about cultivation, time or a chess-like gambit. It’s about communicating the ‘how to help’… now/today. If they don’t say, “Wow!” then we effectively JUST ASK around the goal… and get permission to talk about the funding plan on the next (second) visit. Follow-up – is a STRATEGY, not an ACTION ITEM. My goal is pretty much the same on every first visit. It’s to get the other person to say, “Wow, this is great, what can I do to help?” Tom embedded this simple goal early on – and it’s stuck. If you can get the other person to say – in effect – “I’m in!”, then it’s not about cultivation, a series of complicated chess moves or backroom meetings about ‘timing’. It is about answering the question: What can I do to help? * Clearly communicating the CAUSE. * You’ve created ENGAGEMENT. In all likelihood, you’ve listened your tail off to do so.